Reclusive British street artist Banksy has reworked one of his most celebrated pieces to mark the third anniversary of the ongoing conflict in Syria. The image of a girl with a balloon will be projected onto various international landmarks on 13 March, among them the Eiffel Tower and Nelson's Column. The new image will promote #withsyria, a campaign to rally support for victims of the conflict. It is based on a stencil first seen in London in 2002. In a statement on his website, the artist made reference to the 15 children whose detention for writing pro-democracy graffiti triggered the first protests against the Assad regime in March 2011. The protests "led to an outbreak of violence across the country that would see a domestic uprising transform into a civil war displacing 9.3 million people from their homes". 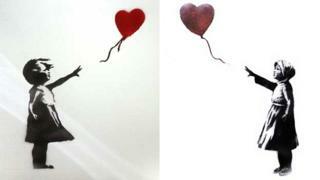 Thursday will see a "global recreation" of the Banksy artwork, with red balloons being released simultaneously in squares around the world to mark the conflict's anniversary. A vigil will be held in London's Trafalgar Square from 1800 GMT. Actor Idris Elba has lent his support to the campaign, voicing a video featuring music from fellow supporters Elbow. Other celebrities including Edith Bowman, Peter Gabriel and David Milliband have joined in by posting pictures of themselves holding red balloons on Twitter and Instagram.